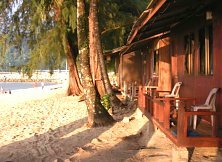 A group of my scuba-diving friends stayed here on a scuba-dive safari and the consensus was that Sofia by the Sea is actually quite good value for money, particularly if you're in Tioman for scuba-diving. Sofia by the Sea is run by East Divers, the outfit that we were diving with, so obviously combing scuba-diving with accommodation under one roof was convenient for us. The other thing we liked was he fact that we were collected at the village jetty by a member of Sofia by the Sea staff. All luggage we had on us, including our heavy dive gear, was transported to our rooms in a little vanette, which enabled us to just stroll to the resort location, about 10 minutes or so from the jetty. Free and easy. Nice! Sofia by the Sea is situated right on the beach. In fact, it's a mere few steps away from the waterline. And the view from our chalet window was spellbinding, exactly like the pictures you see in the websites about Tioman Island. Sunsets here are simply stunning. Many a beverage was consumed lounging around the front porch, gazing at the sea's yellow-orange hues turn a peaceful black. The Sofia by the Sea rooms are clean. This is a must for us, so way to go Sofia by the Sea - full marks for cleanliness. As far as we're concerned, the fact that the rest of the rooms is quite basic is just fine. It's important to note that Sofia by the Sea is not The Waldorf Astoria, so don't expect too much for your budget dollar. That said, you do get air-con and hot-water if this is required, so just let them know when you're doing your booking. Fan-only rooms are available for backpacker-type travelers. By the way, soap and towels are provided also. Food-wise, Sofia by the Sea includes a bistro-type establishment and the F&B on offer here is surprisingly delicious for such a modest set-up. We ended up having all our meals here. However, for those interested to explore other kitchens, there are a few eateries within 5 minutes radius that you can try also. But before you do, do have a go at the Sofia by the Sea BBQ, because the seafood/beef/chicken spread is just divine. Other amenities near Sofia by the Sea include a little provisions shop and a duty-free outlet, both a short stroll away. Also drop by Cabana Tioman, a happening little lounge area right off the beach that plays some smooth ambient tunes. We found it a great place to unwind and soak in the lazy Tioman mood. Whether you're new to scuba-diving, keen to do PADI, or a hard-core scuba pro, Sofia by the Sea is the place to be. Not only because of the comfy stay, but also because the dive masters here are longstanding professionals with an obvious passion for diving. In fact, the people on this slice of Tioman really make this place the awesome place it is. Will we be back here? Pretty much a no-brainer: Yes, we will. Tip: Have a look at some of the packages offered by East Divers and Sofia by the Sea, because they're quite attractively priced. If the sea-facing rooms are fully booked, then opt for a garden room. It's peaceful, great for napping on a hot afternoon. Since Sofia by the Sea is popular amongst the ever-growing Singapore and Malaysia diving communities, it makes sense to book your chalet early, especially on weekends. For those inclined to book online: Agoda.